These days, website design and aesthetics play a bigger role in the success of an online resource because people have higher expectations with regard to the sites that they are visiting. This is especially true for education related websites because there are a lot of businesses and institutions that promote classes, tutorials, and educational products online. If you want to succeed in marketing your education website, then you have to stand out among the rest. You have to make your site more pleasing to the eyes than the others. With our Education Agent Template readily available, you don’t need to be a professional website designer to make your online resource impeccably stunning and professional-looking. 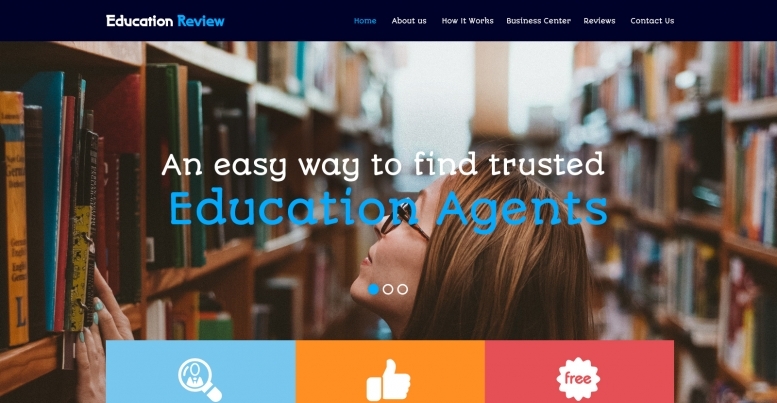 The homepage of the Education Reviews features an attractive banner slider, with three sections of the summary of the website. Our Education Agent Template have very interactive and 100% responsive designs to give the website visitors a good user experience. This template have multiple web pages to minimize redirecting. Furthermore, each web page is clean and free of clutter. Users can subscribe for the newsletters easily and the template presents a very attractive footer section.